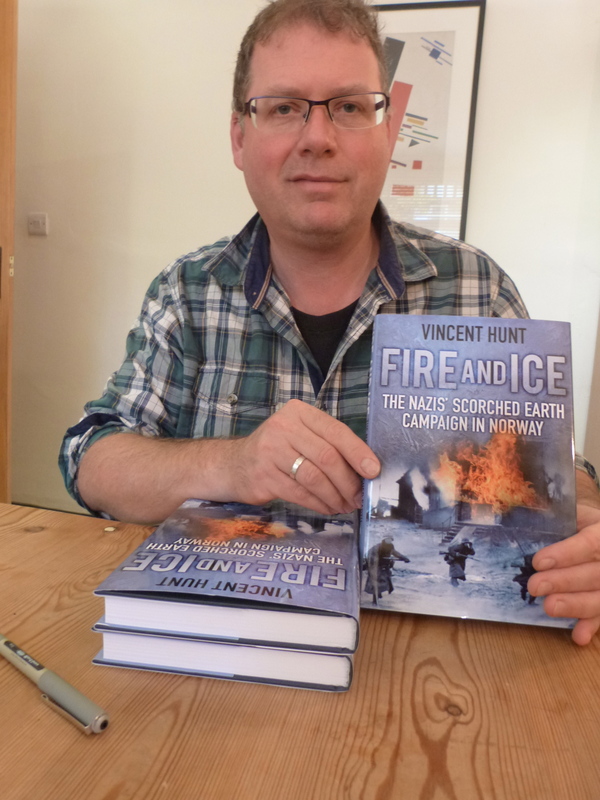 Vincent Hunt with his Norwegian scorched earth oral history ‘Fire and Ice’. It’s a great honour for me to be a guest speaker at ‘Den Norske Club’ in London, a social and networking club that’s at the centre of the UK’s Norwegian community. As part of the informal Friday evening drinks event, I will be talking about my scorched earth book ‘Fire and Ice’ and recounting some of my experiences as I moved east to west across the Arctic, from Kirkenes to Tromso, gathering my interviews from eye witnesses and those affected by the scorched earth destruction of 1944.
and there’s a jacket and tie dress code.See you there at 6.30pm.Vince Hunt* ‘Fire and Ice: the Nazis’ scorched earth campaign in Norway’ is published by The History Press, priced £20. This entry was posted in 20th century history, Finnmark, military history, Nazi, oral history, tactics and tagged author, Nazi, Norway, oral history, writer. Bookmark the permalink.